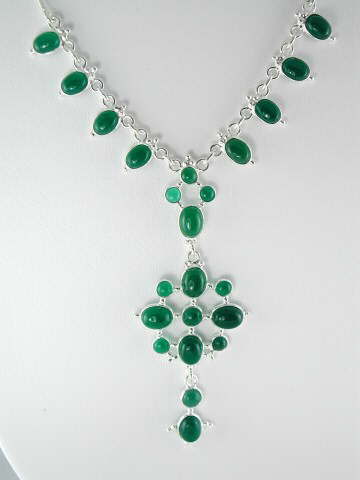 Classic and elegant, Green Agate, cabochon necklace finished with a 925 sterling silver snake chain. In daylight, the stones shine a beautiful bottle green. The properties of Agate vary from stone to stone depending (mainly) on their colour, but all Agates share some common properties. Generally speaking in all its forms it is renowned for its ability to balance energy on all levels but especially for Yin/Yang balancing. Emotionally, Agate can be useful for dealing with feelings of envy by helping us to understand and accept the place or situation we found ourselves in that brought about the initial feelings. Through this understanding Agate helps ground the low-vibration energy (works well with feelings of jealously too), releasing us to progress more freely with our spiritual development. Agate is also known to enhance creativity making it an excellent stone for artists. The green variety resonnates especially well with the Heart Chakra.